We have always done our part to be as “green” a company as we possibly can. We are continually looking for new ways to cut down on vehicle emissions, fuel consumption and to try to reduce the amount of waste that ends up in our landfills. For the sake of our children and our children’s children, we all need to do our part to minimize our carbon footprint. This is not only for each of us as individuals, but also for those businesses concerned for the environment. In the past we have reached out to our community and have been able to reuse and recycle some of our expendable glass products through donations to our arts schools, local governments or anyone that may be able to take advantage of some of our smaller pieces of glass that may be normally discarded. Occasionally we get phone calls asking for us to contribute to one project or another and we usually can come up with something to be able to help and at the same time, limiting the amount of glass the ends up in our dumpster. Through all of our efforts the reality was that we were only able to reuse or recycle only a fraction of the amount of the waste glass…until now! Rapid Glass is very happy to announce that we have looked high and low and have conducted much research, but have finally worked out a partnership with a glass recycling company. 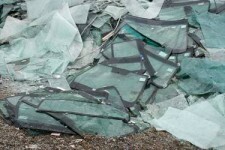 Instead of hauling literally tons of windshields, auto glass and home window glass to the landfills, we will begin hauling virtually 100% of our waste products to a glass pulverizing facility for recycling. In many of these uses the recycled glass performs better because it last longer,doesn’t absorb moisture, drains better and doesn’t harbor bacteria. So next time you are calling around to find someone to service your car or your home, ask them if they recycle their glass and what they are doing to improve the environment. We are proud of what we stand for and hope other small businesses will follow our lead.